Red-tailed Hawk at nest.... Not the best photo but one cannot stick around their area that long without disturbing them. I like this hawk and hawks are pretty awesome when they are soaring high in the sky to. This nest was in a White Pine tree in Mn. April 2018. In this photo you can see the rusty or reddish brown tail. Immature Red-tailed Hawk in Flight. Black Dog Preserve is located on the south side of the Minnesota River in Burnsville. This hawk caught my attention on a cold winter day. 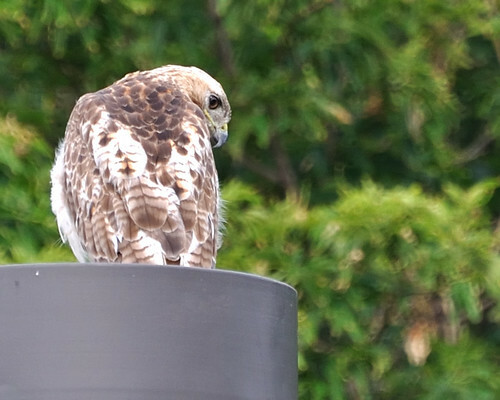 I saw this hawk on a flagpole the day before I took these shots. I decided to bring the DSLR the next day knowing the chance I'd see it again would be remote. I saw it on the top of the light pole as soon as I pulled into the parking lot. As I approached, I took some shots. Within a minute or two, it swooped down to grab a mouse. After it secured its prey, it proceeded to the top of another light pole nearby. For the nest several minutes I watched as it tore apart and ate the little mouse. The last 12 or so in this set are from 8-18-10 but it might be the same hawk. It hangs around work fairly regularly. A short close up movie of Samantha a Red-Tailed Hawk and Kent Mahaffey. Berwick Productions. Thank you for your support in caring for our birds. This is probably the most common hawk in North America. If you've got sharp eyes you'll see several individuals on almost any long car ride, anywhere. 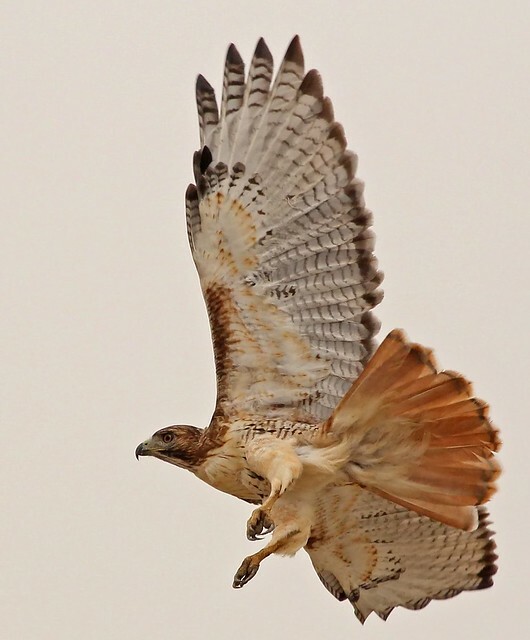 Red-tailed Hawks soar above open fields, slowly turning circles on their broad, rounded wings. 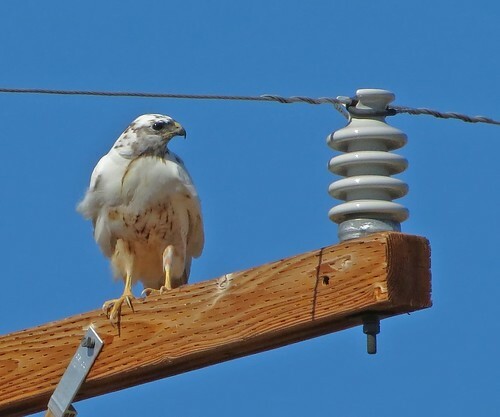 Other times you'll see them atop telephone poles, eyes fixed on the ground to catch the movements of a vole or a rabbit, or simply waiting out cold weather before climbing a thermal updraft into the sky. ** Did you know? 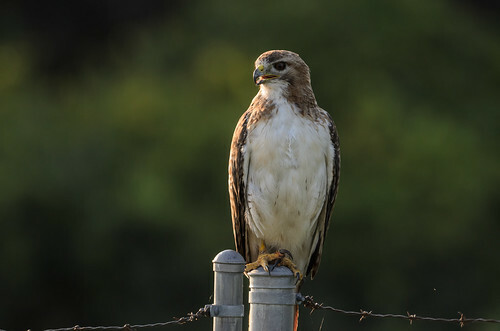 The red-tailed hawk is displaying an aggressive posture when it holds its body and head upright while its feathers are standing erect. Texas Red Tailed Hawk stalks, pursues and eats a large Fox Squirrel on January 5, 2014 during very cold weather for Texas and high winds. Hawks are carnivores (meat eaters) that belong to the category of birds known as raptors -- birds of prey. They have strong, hooked beaks; their feet have three toes pointed forward and one turned back; and their claws, or talons, are long, curved and very sharp. Prey is killed with the long talons and, if it is too large to swallow whole, it is torn to bite-sized pieces. 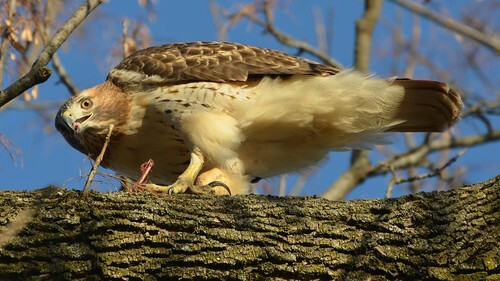 The red-tailed hawk is a most opportunistic hunter. Its diet is varied, but there is conclusive evidence now that 85 to 90 % is composed of small rodents, with rabbits, snakes and lizards included. Like all hawks, its talons are its main weapons. It was singing perched next to a grassy region. I have noticed a slight increase of the Eastern Meadow Lark due to a few more grassy or meadow like areas for them to live. Very nice sight to see and real pleasant to hear it sing. Location: Rural Norman Co. Mn.